The purpose of this labour market bulletin is to inform young people - and those that advise them - including teachers, parents, carers, careers advisors and others, of the employment trends and job opportunities available locally, now and in the future. Thought about an Apprenticeship? Check out the the downloads below for an informative presentation on all things Apprenticeships from Oxfordshire Apprenticeships. GetMyFirstJob offers you a whole new way to find your first Apprenticeships & Traineeships job, with the best employers and training providers. Providing quality pre-apprenticeship programmes and Apprentice training in Brickwork, Bench Joinery, Construction Operations (Groundworks), Maintenance Operations and Site Carpentry as well as introductory and part-time courses, OSAT and schools programmes. 2019 Open Morning Dates. Click here for further details and information on Saturday Open Mornings. These open mornings have proven really useful for prospective students and employers to take a look around and talk to the team. Appointments for visitors at other times can be arranged to suit. March 2019 Open Evening for Year 11 families. Click here for futher information. 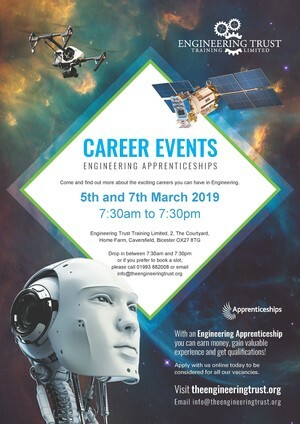 Engineering Apprenticeship Event with the Engineering Trust: 5 to 7 March 2019, Bicester OX27 8TG. The Engineering Trust have set up a Registration page for young people who are interested in Engineering. If you register with them they will keep you up to date with their latest news, vacancies and events. Please follow this link to complete the Registration form. Please follow this link to see the current list of apprenticeship vacancies with Abingdon and Witney College. Click here to apply for any of the vacancies or visit the Government find an Apprenticeship web page to search for apprenticeships in your area. At Oxford University Hospitals we offer a variety of education, training and development opportunities for new and existing staff, including apprenticeships both for young people and existing OUH staff. Recruitment for the new Police Constable Degree Apprenticeship (PCDA) – this will be one of two main routes into policing once it’s introduced. The other route is the Degree-Holder Entry Programme for people who already hold a degree in another subject. The PCDA will be a three-year programme of blended academic and ‘on-the-job’ training, with student officers being warranted from day one. Applicants may require 2 A ‘Levels plus have met our other eligibility requirements including age over 18, citizenship, drivers licence at point of formal offer, be in good health – they will have to pass a fitness test and also be able to pass our tattoo/piercings policy. There are no tuition fees as all learning is paid for via TVP’s apprenticeship levy. Student officers will do a blended programme of learning, much of which will be on-the-job – they will need to gain their Independent Patrol Status and Full Operational Competence during their probation – once they have passed their learning will be accredited with a Degree in professional Policing Practise. They will also then be able to look at promotional and specialisation routes. Ignite Sport UK is a leading training provider in the provision of sports-related apprenticeships, NGB awards and vocational qualifications. Apprenticeships are available at Intermediate Level (2) and Advanced Level (3) for individuals wishing to develop a career in an exciting industry. Our apprenticeships are suitable for 16-18 year olds as well as 19+ learners with a strong interest in sport, leisure or play. Ignite Sport UK will identify suitable vacancies and prepare your application. Upon successful placement, Ignite Sport UK will provide full training, qualifications, mentoring support and guidance throughout your journey. AirTanker's Aeronautical Engineering Apprenticeship Scheme: If you interested in Aviation and looking for a challenging opportunitywithin a dynamic engineering environment? Click here for more information. Our Aeronautical Engineering Apprenticeship Scheme offers you the opportunity to join a unique Engineering team at AirTanker, supporting the Royal Air Force and commercial airlines. Level 3 Advanced Engineering Technical Apprenticeship scheme. Click here for more information. Oxfordshire Advanced Skills (OAS) offers high quality training for apprentice engineers and technicians at technology businesses in the Thames Valley. Engineering Apprenticeship available with OAS. Available to Year 11 and Year 13 leavers. Click here for current apprenticeship opportunities. Oxford Energy Academy (OEA) is Oxfordshire’s leading training provider for plumbing and heating apprenticeships. We have new apprenticeship courses starting in September 2019 and are running a taster session on Monday 8th April. The taster session will give students an opportunity to visit our training centre, meet the tutors and try out some of the facilities in our workshop. 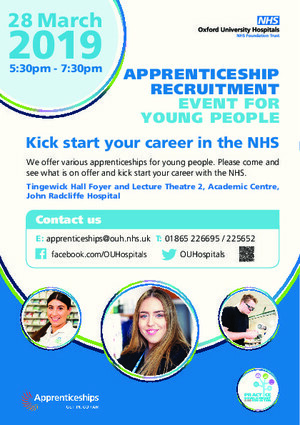 There will also be an opportunity to meet an employer and receive some advice on finding employment. We recruit and train apprentices for our franchised sites, with vacancies available throughout the whole of the UK. Apprentices train as Light Vehicle, Heavy Vehicle or Semi-skilled Technicians or for those wishing to gain skills in a sales or customer service role we have our Retail Parts Advisor or Customer Service Specialist. Learn from the best. We’re a global business, with a proud history and brilliant future ahead. With us, you’ll be working with world-class engineers and other professionals who are passionate about passing on their experience and helping you to build your future career. Trainee Hairdresser working in a Salon based in Chipping Norton.